For those interested in roaming around Rome a little bit off the beaten track, until 31 December 2014 Villa Torlonia will be worth a visit more than ever. The beautiful neo-classical & liberty structure which belonged to nobles Torlonia, and which was home to Mussolini and his family, just opened to visitors two more sections: the theatre and the bunker (built at the very beginning of the II World War). 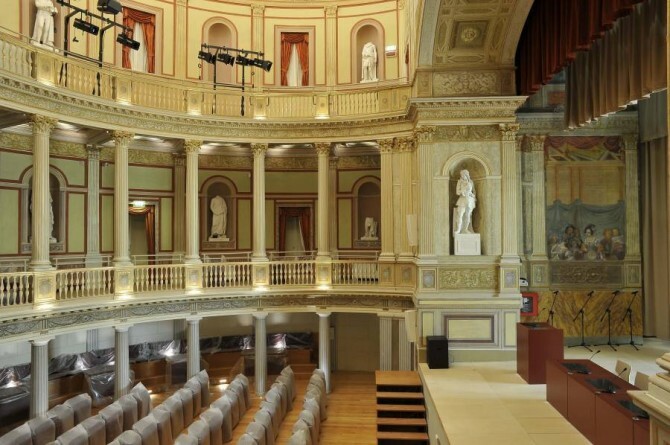 After long time restorations, the theatre will serve again as a collector of events such as plays and concerts. Beyond this, it will be accessible during the day as well, even if upon mandatory booking (which includes a guided tour as well). The same opening conditions are provided to visit the bunker. Venue: Villa Torlonia, Via Nomentana 70. Ask Yes Hotel’s staff for more details & reservations! Not only electronic music, experimental dance and interactive exhibitions. Until November 30th, ROMAEUROPA FESTIVAL 2014 offers you a deep immersion into the latest trends in contemporary arts throughout the works of talents from all around the world. Historical locations such as La Pelanda (Ex Mattatoio), Accademia di Francia, Teatro Argentina, Teatro Brancaccio will be the roman stage to this two-months event. If you are looking for the best accommodation to reach them all, then don’t hesitate to book with us at http://www.yeshotelrome.com/ ! By following this simple tips you may have not a story to tell about a taxi driver that has left you with a wallet excessively empty. Before taking a cab ask our staff about how much a fair price will be for the desired destination, which helps you to avoid unpleasant situations. It is true that our hotel is just around the corner from Termini Station, but also half a block from Piazza Indipendenza. The point is that from Termini you pay a supplement of 2 euros more, that you save instead from the stand at Indipendenza square. There are two airports in Rome: Fiumicino and Ciampino. There is an official rate for taxis which is from our Hotel 48 euros to Fiumicino and 30 euros to Ciampino. This price applies for a maximum of four persons and four bags. Any trip to the historic centre should show up as Tariffa 1 on the meter. Tariffa 2 applies beyond the Grande Raccordo Annulare and it is charged at a higher rate. Make sure that the driver has set the right Tariffa while traveling to the Roman centre. Rome taxi drivers prefer to use taxi stands. You might be able to flag a taxi down, but it is a rarer occurence than in most cities. Romans know they’ll find a taxi stand in all the major piazze. Official cabs are white, have a taxi sign mounted on the roof, have an insignia on the driver’s door reading “Comune di Roma,” have an official number and a meter. You want an official cab. Do not use the touts at Termini Station. Supplement from Termini Station plus 2 euros. * Each piece of luggage with the following dimensions cost (cm 35x25x50) €1,00 each.. If you feel you have been cheated by a taxi, the driver’s license number is written on a metal plate on the left door on the passenger side. Make sure you get a receipt or ricevuta and write down the name and number printed on the plate. In addition, you should also take note of which cab company you used .With this information, you can file a complaint with the cab company and should be able to receive reimbursement. And remember that our staff will assist you with all the information you may need. See you soon. CONCERTO IN ROME: Mamma Mia! Hello music lovers! The Opera House in Rome il ‘‘Teatro della Opera’’is located near Piazza Repubblica, which is only five minutes walk from our location Eventually there are in Rome also churches where concerts take place. But for the best Acoustic the Opera House remains on top.. Undoubtedly opera and ballet in Rome is something special and carries its own magic flavour. See you very soon and enjoy it! Here follows the season 2012-2013 program. 22 December to 5 January: Don Chischiotte. Ballet. Music by Ludwig Minkus. 27 January to 3 February: Il Naso. Opera. Music by Dmitrij Šostakovi?. 28 May to 5 June: La Sylphide. Ballet. Music by Hermann Severin von Løvenskjold. 16 July to 23 July: Nabucodonosor. Opera. Music by Giuseppe Verdi. Over 60 million records sold for a band which creative force gave birth to authentic immortal masterpieces of rock. Their unique style combined elements of classical music, jazz, hard rock, folk and art rock Live performance added to sound vibration the magic spell of an amazing theatrical atmosphere. Jethro Tull and their charismatic leader, Ian Anderson, has proved along 40 years to be one of the greatest icons in the rock and roll scene. The Anderson’s stage personae, an incarnation of God Pan, with his intense and playful nature provided much more than simple entertainment but inspiration to generations of rock lovers. From their beginning as an experimental blues band Jethro Tull developed a powerful and delicious way of expressing music. EtruriaEcoFestival is an event, now in its sixth edition, which features musical and artistic events of national and international. The event has the ambitious goal to combine the artistic and cultural heritage through the promotion of all issues related to environmental protection and the protection of the territory. Etruria Eco Festival is not only great music, dance and theater. This year for the first time is also 100% eco village with over 40 stands (Library, crafts, vintage clothing and eco-friendly, T–shirts, natural fabrics, ethnic products, bags, decorations, ecobigiotteria, solar cookers, systems for energy savings associations, and more cooperation). The Festival is in the beautiful park of Legnara of Cerveteri, a city of the Province of Rome. The village is open daily at 18 and always FREE!